The Astronomik UHC is THE filter for visual observing. You will enjoy using your Astronomik UHC filter because you will see more stars and more details in deep-sky-objects compared to using filters from all other manufacturers. Astronomik UHC filters’ astounding high light transmission brings better views of deep-sky-objects even to small telescopes! The high transmission of our optical glass filters means that enough light is available to allow successful visual observations with telescopes beginning at 2" (50mm) aperture. Our Astronomik filters are optimized for use with telescope focal length f / ratios of f/4 to f/15. Transmission losses and chromatic distortions, which arise with other filters, only occur with Astronomik filters when extremely bright aperture ratios of 1:2 and more come into play. Another major advantage of our Astronomik UHC filter is the high optical quality of the filter glass. 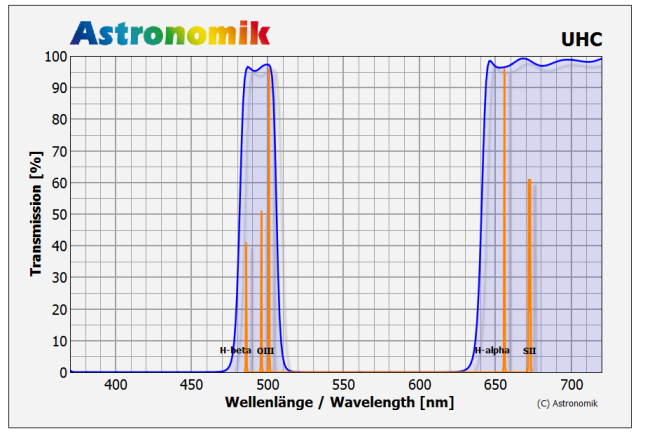 When using Astronomik UHC filters you will quickly notice the same needle-sharp stars which you are familiar with from your astronomical instrument without any filter!